A Minnesota based utility has announced plans for a biomass power plant in northern Wisconsin. Xcel Energy plans to convert its existing coal fired generating plant in Ashland to burn biomass exclusively. 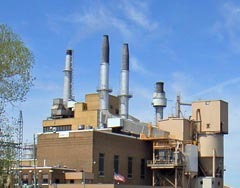 The plant already burns wood waste to augment coal. The plan draws kudos from Mark Redsten, executive director of the environmental group Clean Wisconsin , who says the completed Bay Front plant will be the largest biomass power plant in the Midwest. Redsten says the Ashland project from Xcel looks even better, when compared to plans from Alliant Energy, to build a new coal fired plant in Cassville. That plant, he says “will potentially burn some biomass product,” although Clean Wisconsin and other environmental groups have voiced skepticism over Allaint&apos;s projections that the plant may eventually burn up to 20 percent biomass. “They would have to truck in wood waste from far away, in order to burn the twenty percent,” says Redsten. Redsten says the Xcel plan is just one of several announced proposals for one hundred percent biomass powered plants, which are spurring rapid growth in the state&apos;s biomass market.